Infamous British politician of yesteryear Enoch Powell didn't always talk sense, but when he said that 'all political careers end in failure' he was indeed being highly lucid. I've no idea if Powell liked F1, but his words could just as easily have applied to that pursuit too. And such thoughts would likely have hung very heavy to Michael Schumacher in recent days. The most successful driver by a distance in F1 history was reduced almost to the role of footnote in the grand news of Lewis Hamilton joining Mercedes, Schumi being cleared out of the team to make way. And as part of the aftershocks of the move Schumi, rather than seek a drive further down the pecking order, announced his retirement from the sport days later. It was doubly unfortunate that it came right after a rather egregious error of judgment by Schumi in the Singapore Grand Prix, though to draw any inferences from this would be flawed as the error was atypical of a year in which Schumi, if not quite the driver he was, still drove well. But, such is life, no matter our achievements almost none of us get to stop at a time of our own choosing. Whatever the circumstances of his bowing out though Schumacher's impact on F1, and his other-worldly levels of success, cannot be overstated. Rather than leaving his imprints on the sport he stamped size 12 boots all over it. His records defy belief: in a career spanning 21 years from beginning to end and some 301 starts (and counting), he totalled seven world championships, 91 wins (and that's only one shy of the totals of the next two combined - who go by the names of Alain Prost and Ayrton Senna), 77 fastest laps and 68 pole positions. Schumacher didn't so much rewrite the F1 record books as redefine them. Most of his records will likely stand for ever. So, the statistics say that Michael Schumacher is the greatest F1 driver ever. And while statistics only mean so much in F1 when comparing the merits of drivers, given one inevitably ends up with imperfect comparisons, only a churl would argue that he isn't at least among the very best ever seen in the sport. And we don't have to rely on dry statistics to demonstrate as much. For me Schumacher's greatest achievement as an F1 driver was that he, probably more than any other in the sport's history, redefined what is required of an F1 driver. To put it in simple terms, he raised the bar in a way never done by any one individual before or since, and much of his gargantuan success came when everyone else was scrambling around either bewildered or furiously seeking to adapt. The main way that Michael Schumacher discarded the orthodoxy was that he drove every lap of a race at the very limit, literally like a qualifying lap. Before him, the norm was to push to the maximum in the single tours of qualifying, and perhaps in select parts of a race, but definitely not for a race's duration. Indeed, even the mighty Ayrton Senna when speaking about the effort he summoned for a single lap qualifying run suffixed it with: 'In race conditions you can't keep to that level, there's too much stress, both mental and physical'. Schumi changed the game on this; while he would likely admit himself he didn't have Senna's raw ability over a single lap, unlike Senna he could drive at his maximum for an entire stint of 20 laps or more. And in many ways it was perfect timing. Like many of the greats Schumi embodied his era, and the formula of his peak years could have been designed with him in mind. In past generations cars would usually have to be nursed through a Grand Prix if you had designs on finishing, or indeed on keeping your tyres in working order, but by the time Schumi appeared on the scene cars were becoming unburstable for the most part, tyres were easily lasting a race distance, and the 'refuelling' era turned F1 races into a series of sprints. All this suited Schumi just fine. Allied to this was another way in which Schumi changed the game: his fitness levels were super-human. As Senna mentioned, prior to Schumi even if a driver was minded to push at the maximum for an entire Grand Prix they almost certainly couldn't physically have done so. Schumi changed the norm on that too, and the almost suffocating fitness regimes of any modern F1 driver reflect Schumi's epoch. Another way in which Schumi raised the bar was in terms of his commitment to the task and taking a holistic approach to getting the job done and improving his chances. Of course, building a team around yourself and seeking what Mark Donohue called 'the unfair advantage' was by no means a new thing when Schumi appeared, but what he did do was take it to completely new levels. The package that Schumi was able to build around himself, especially in his peak Ferrari years, was stellar and probably nothing as potent will ever be assembled in F1 again. Hell, even Bridgestone constructed tyre compounds to suit his driving style. And Michael Schumacher's appetite for the job and for work seemed insatiable. The myth built up over time of Schumi pounding round the Fiorano test track all day every day like an ever-lasting Scalextric toy wasn't actually all that far from the truth. Indeed, as late as the off-season between the 2005 and 2006 seasons (at no less than 37 years of age) Schumi completed no fewer than 17,000 test kilometres. And this was in addition to his marathon PR work. Such endeavour was unthinkable to those from previous generations. Of course, with testing restrictions and the like such an undertaking would be impossible to replicate these days, but the legacy remains tangible nevertheless. The holistic and industrious approach taken by the likes of Fernando Alonso and Sebastian Vettel at the sharp end of F1 today clearly owe much to the path beaten by Michael Schumacher. But the extent, and the duration, that Schumi practiced such a modus operandi was only made possible by what I believe is the most admirable part of Schumacher's F1 career. His motivation, enthusiasm and energy, and most pointedly his ability to sustain them at such a high level over upwards of a decade at the top, was truly breathtaking and absolutely unprecedented. Before Schumi it was common for drivers and teams to, subconsciously and by fractions but with a significant impact on results, to 'rest on laurels' somewhat after success and require time to summon further motivation. That's why, historically, winning back-to-back championships was relatively rare in F1 (when Prost did it in 1986 he was only the fourth driver in history to do so). And think of Schumi's adversary, Mika Hakkinen, who showed outward signs of exasperation after just 18 months at the top. But, whatever the success and the duration of it (and as explained there was an awful lot of both) those never seemed to be a factor with Schumacher or the Ferrari team created in his image. No matter how well prepared his rivals were, or how determined they were to succeed, for year after year it seemed Schumi and his team were more so. One incident that summed it up for me was at the 2004 Australian Grand Prix. 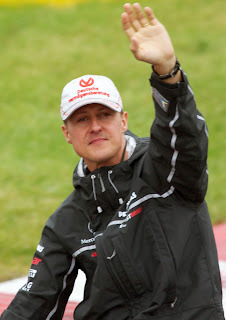 Schumacher had won the previous four world drivers' titles, and indeed had by now six of them in total, and in the opening round of the 2004 season at Melbourne Schumacher won as he liked. But there was no sign of him being accustomed or complacent with success as Schumacher, having celebrated with his team before turning to climb the stairs to the podium, seemingly unaware that the camera was on him and with a broad smile on his face had a quiet fists-clenched celebration to himself. It was almost like he'd just taken his debut F1 win. Maintenance of such spontaneous joy in winning after such sustained achievement is in my view extraordinary. It was a close to constant theme of Schumacher's F1 career, certainly in his 'first' stint, that he maintained a child-like joy in driving F1 cars, something that was perhaps reflected in that to compare pictures of Schumacher in 1994 with those in 2006 there was almost no sign of physical wear and tear in the intervening 12 years; about the only way of identifying the year with confidence was from looking at his overalls. It was almost like the driving part of things came easy to him, like he was getting all of his success just by replicating what he'd always been doing ever since racing go-karts. It wasn't that easy of course, but it seemed that way. And Schumi's tool-kit was all put into practice to provide us with some of the most extraordinary race day drives that you'll ever be likely to see from anyone; drives in which you could scarcely believe what you were witnessing, drives that would come close to shaking your very being. Many of Schumi's finest works came on days when his fabled ability to reel off a succession of qualifying-style laps was put to perfect use. This was most notably the case in Schumi's celebrated win in Hungary in 1998. Sitting behind two apparently superior McLarens at the race's mid-distance the strategy which emerged from the Ferrari pitwall seemed to defy logic: switch from a two-stop to a three-stopper, pit early, short-fill the car, then make up the entire time of a pit stop on the McLarens before pitting for the final time and thus emerge with the lead intact. 'He then put in, sort of, 15 qualifying laps!' opined his technical director Ross Brawn, 'He had to make up something like 19 seconds in 19 laps ...I remember saying it to him and he just said "OK"! There was no "Oh Christ, there's no chance...". Schumi did indeed make up the time to win, even having enough seconds in hand for a brief off-track excursion. But the succession of laps was awe-inspiring, as the sector times were banged in one after the other it was like reality as we knew it had temporarily been suspended. And this was no isolated performance: in his famous win in Canada that year when he hunted down Giancarlo Fisichella after a penalty, at the Nurburgring in 1995 when he chased Jean Alesi from a mile back to pass for the win with just two laps left, and in his glorious tête-à-tête with Mika Hakkinen in Japan in 2000 to clinch his first Ferrari title, when the rest were reduced to the status of merely things which made noise, the story was the same. Schumacher was also notable by a wet weather genius, wherein he'd frequently make all other F1 pilots look positively inept on days that the rain came down. This was seen most graphically in the Spanish Grand Prix of 1996. 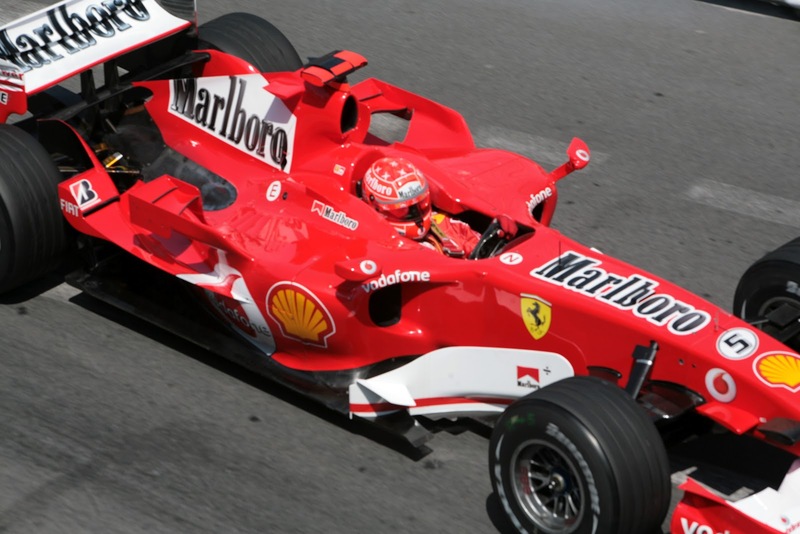 That year was Schumi's first at Ferrari, and the car wasn't a classic. And in weather that would probably not even get green flag racing these days he fell into the pack at the start; by lap 13 he was leading and then he proceeded to lap routinely four seconds quicker than anyone else. Needless to say no one else saw him again that day. So, with all of this combined with the stratospheric numbers why did I say that Michael Schumacher was 'among' the best ever rather than being unequivocal that he was the best, even taking into account the usual difficulties of comparing different drivers of different eras? This isn't to say he wasn't, you could certainly make a credible case for him being the best ever. But there is by no means a consensus on the matter. When assessing Michael Schumacher's legacy it would be remiss to ignore the most obvious downside however. Like Senna his was a flawed genius, featuring persistent if often unrelated controversy. And like Senna this ensures that there usually is an asterisk against his achievements. Just as with Senna there was at best a ruthlessness at worst an egregiousness in Schumacher's driving when wheel-to-wheel which often was ugly. Just as with Senna he sought to settle a championship in his favour with a deliberate accident (indeed he probably did so more than once). And while Senna broadly saved up his worst excesses for when he was up against Prost, in Schumi's case he didn't even offer that distinction as he served up such treatment to all-comers seemingly. And just like with Senna Schumacher seemed oddly immune to sanction for this from the powers-that-be for the bulk of his career. But ultimately it was all to Schumi's own detriment; as Martin Brundle once noted that if Schumi hadn't adopted such tactics then perhaps you could take one title and around 10 wins off his totals (which would still leave him top of the tree on both counts). But his legacy would be much more unequivocally positive. In harness to this somewhat other controversies were dotted through Schumi's career at seemingly regular intervals. In some cases he's been unfairly criticised, such as in Benetton's technical controversies of 1994 and in 'team order gate' in Austria in 2002, given it's not clear the extent that Schumi was personally culpable in either. Perhaps the most regrettable controversy was that in Monaco 2006 however, when late in the qualifying session Schumacher, at the top of the times but not improving his time on his final run, deliberately 'parked' his Ferrari at the Rascasse corner in order to impede others from improving their marks. It was regrettable not only in its actions but especially in its timing, as perhaps at this point people were beginning to forget to a large extent about what the German media referred to as 'Schummel Schumi' (loosely meaning 'cheating Schumi'). But this act brought it all back, and was seen widely as the latest of a lengthy line of cases wherein Schumi's competitive instincts had an unpleasant manifestation. And Schumacher's stock public reaction to such cases, while fascinating, perhaps didn't help how he was viewed. 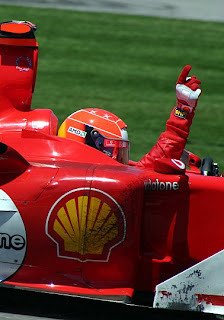 While those close to him acknowledged that on some occasions Schumi would in private accept when he had over-stepped the mark (and later in his career he began to talk more openly in public that he'd do some things differently given his time again), in public for the most part Schumi would firmly maintain the position that he felt he'd done nothing wrong. As Ross Brawn noted Schumi's broad view was that all was fair in love and war: 'He had this view that it was a tough business, you have to give everything and give no quarter'. Among Schumi's high profile controversies only after Jerez in 1997 (when he'd tried to settle the championship in his favour by colliding with Jacques Villeneuve) did he admit fault, and even there apparently it had to be forced out of him by Luca Montezemolo. If Schumi's enjoyment of driving was child-like, for the bulk of his career there was also something child-like about the simplicity of interpretation and instinctive absolution of himself displayed when his controversial actions were being criticised. Others contend that Schumi even with his success was rather mistake-prone, particularly when under pressure. This is to a large extent undeniable, in that Schumi would spin or have off-track excursions with regularity, perhaps on average leaving the track in a weekend more than Fangio, Clark or Prost would in a season. And in plenty of championship deciders Schumi erred, such as tagging the wall in Adelaide in 1994 and driving like a novice in Suzuka in 2003. 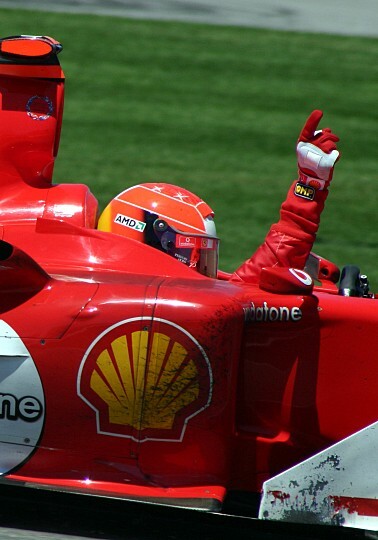 His sometime team mate Rubens Barrichello attributed this characteristic to, in his view, that Schumacher 'only knew how to drive on the limit...he didn't know how to go slowly' (if true it may shed some light on why Schumi struggled to adapt to the more endurance-type F1 he returned to in 2010 onwards). Perhaps to some extent it also reflects Schumi's era, in that while in days gone by off-track excursions would be punished, certainly with damage to your car, and perhaps to yourself, in Schumi's era run off areas became much more generous and benign than before, and perhaps therefore it became more viable to explore the limits. And, either by accident or design, Schumi had a knack of getting away with his errors. Other criticisms of Schumi's legacy are harder to pin on him. Some have argued that Schumi usually had things a bit easy; perhaps he cleaned up at a time when he didn't have a strong cast of contemporaries, with as mentioned an extraordinary package of team support, as well as with a team mate forbidden from challenging him. Much of these can be dismissed at the broadest level. If his cast of contemporaries was relatively weak then that is hardly Schumi's fault, and it could be argued that many were made to look weak by Schumi's raising of the bar. And as for the team around him, Schumi played an active role in building it and as mentioned seeking 'the unfair advantage' is a fundamental part of the game. But in some ways those who make such criticisms might be onto something. To some extent Schumi legacy-wise was a victim of his own success: it was much harder to appreciate his driving skill in the years (and there were many) in which he dominated, operating as he was in something of a competitive vacuum. It's perhaps not for nothing that when we spontaneously think of Schumi's finest drives many examples come from the 1996-1998 era, when he struggled manfully against superior cars and his own contribution was plain for all to see, rather than from the years wherein he cantered to titles. Further, the way that the Ferrari team went about its racing in that era of success probably didn't help things. In the Todt-era Scuderia the pitwall often managed races in rather clinical style, and the red cars would appear to cruise around at the front in formation, almost at half throttle. All this served to mask much of Schumi's driving genius. On a similar point, it never ceases to be a regret to me that Ayrton Senna's untimely passing deprived us of a Senna vs Schumacher face off playing out at the top of the sport. It would likely have been titanic, and much to the betterment of the legacy of both. And Bernie Ecclestone once opined that Schumi's refusal to allow a strong team mate competing with him on equal terms was also a matter of regret, and similarly could well deplete his reputation a little. Of course, none of us know for certain the exact extent that the playing fields at Benetton and at Ferrari were tilted in Schumi's favour, and it has to be said he probably would have beaten his various team mates anyway even with the same hand dealt. But Bernie has a point in that a more transparently even playing field, especially in the dominant years, would likely have been a plus to Schumi's legacy. Some also express concern that the relative struggles of Schumi's 'second' F1 career at Mercedes will also count against his legacy. My instinct however is that it won't, although it can't be denied that he was far removed from his former self after his comeback, particularly early on in it. Perhaps the greater mistake than coming back though was that he stopped in the first place. It became clear over time (indeed, it was pretty clear at the time) that Schumi's 'first' retirement had rather been thrust upon him, at least from Schumi's perspective. But it was also fairly clear that had he continued at least one more championship would probably have been his. Indeed, in late 2007 - a year after he stopped first time around - he returned to do some tyre testing for Ferrari and was immediately faster than the regular pilots, including Kimi Raikkonen who'd just claimed the drivers' title for the Scuderia himself. But perhaps it's best not to get bogged down in such things. And just as we remember a great writer by their great works, and not the contents of their waste paper basket, it's better to remember Schumi at his best rather than dwelling unduly on the flaws. Remember him for the undeniable seismic shift he created on what is required and expected of an F1 driver. Remember him for the breathtaking industry, fitness and professionalism almost totally without equal in any era. But most of all remember him for those Sunday afternoons that sent a shiver down your spine, when he did things with a racing car that barely seemed plausible. Fantastic article. As factual and unbiased as I've ever read about Michael. Making him neither God nor demon. Thank you. Thanks very much for those kind words, they're very much appreciated. Very glad you liked it. Graham - a pretty fair summing up of Michael, warts-and-all. My biggest issue with Schumacher, and the reason why I can't place him at the top of the "all-time greats" list, is that I just never saw him as a racer; that is, somebody who could, through guile, determination, or some combination of the two, find a way by someone on the track. His era allowed him this weakness - as you note, he was basically made for the pitstop formula. He can drive flat-out all day, and any impediments were usually gotten around via pit strategy. When asked to operate in close proximity to other cars (not driven by his teammate), Michael was decidedly error- (or bloody-mindedness) prone. If he didn't make a mistake, he couldn't really be trusted. Also, as you noted, he benefited greatly from the increasing reliability/durability of the machinery and tires of his era. In his prime, he had tires that would always hold up to 20+ laps flat-out (unlike drivers of earlier eras, who had to make one set of tires last the whole race if at all possible), and cars that rarely let him down. It's no surprise that he has not been able to adapt to tire management during his comeback - it takes away the thing he's always had during his career: the ability to reel off fast laps with metronomic consistency. In the end, Michael was, by far, the class of the field during what I consider a debased formula - Grand Prix have historically been sprint races (particularly in the modern era), generally running 90-120 minutes. The refueling era broke that down even further, turning every GP into a series of mini-sprints, none of them long enough for any sort of 'race management' to be of any benefit to a driver. It was all about raw speed and the ability to strategize your way past people instead of passing them on the track. I was thrilled when F1 went back to slicks and banned refueling - while drivers don't have to make one set of tires last like they had in the past, the tires do have to be managed, and the ever-decreasing weight of the car also factors into race planning. While some of the efforts to facilitate on-track overtaking are a bit contrived, I prefer this formula to the refueling era, when everyone just decided that passing on the track was just too risky to bother with. It's unfortunate that age and a less-than-top-level car makes it difficult to really judge Micheal's level at this point, but I still don't think he's really suited to this era, and that's fine with me. Fantastic article about my forever no 1 driver!